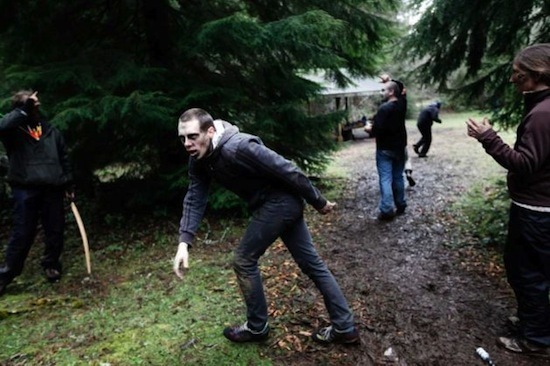 The Seattle PI blog has posted a gallery of the Zombie First Responder course that took place last weekend in Sandy, Oregon. Over 2 days, students learned the finer points of bow hunting, camouflage, and outdoor survival skills just in case civilization starts to die yet keeps on walking. Courses in zombie disposal were, of course, completely tongue and cheek, but if you’re going to spend time camping out in the cold spring rains, why not put a little twist on it? The course was hosted by an eco-education company called Tracker’s Earth. With all the media attention it’s getting, it probably won’t be the last Zombie hunt in the woods.